Summer may be over, but that in no way means that it’s time to store the grill away for the season! In fact the crisper, cooler air make fall the perfect time for outdoor entertaining. Whether you’re looking for a delicious weeknight dinner or fun way to feed a house full of guests, a “Build-Your-Own” Grilled Pizza night is always a hit. 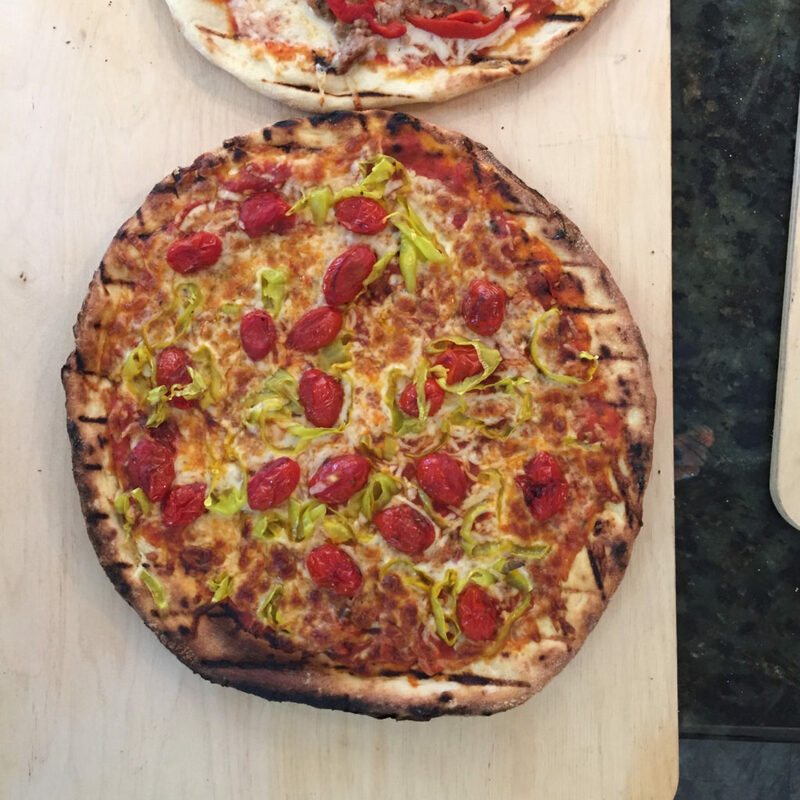 Homemade grilled pizza is less expensive and more flavorful than take-out and a fun way to get creative with friends and family. We always have a blast at our “Grilled Pizza Parties” in the Jeff’s Naturals kitchen. So forget delivery. In less time, you can grill up even better pizza! Here’s how. There are plenty of resources to help you make your own pizza dough or you can pick up some pre-made pizza dough at your local supermarket in the bakery, dairy or in the frozen foods section. You can also check with your local pizzeria to see if they sell homemade pizza dough, just make sure you get enough to feed everyone! Roll out your dough into personal sized pizzas and grill on each side for 1.5 minutes. For the pizza purists, make sure you offer plenty of traditional tomato based pizza sauce (homemade or store-bought). For variety, we recommend offering some fun alternatives like pesto (jarred or homemade), garlic/herb infused oils, ricotta cheese, salsa, wing sauce, BBQ sauce, or tapenade. The sky’s the limit so get creative! Step 3- Add Pizza Toppings & Grill! Plenty of cheese please! Honestly, it’s just not pizza without the cheese! Set out a variety of cheeses to choose from like mozzarella (shredded or fresh), shredded cheddar, sliced provolone, grated Parmesan, Romano, crumbed feta, blue cheese, goat cheese, vegan cheese…you get the idea. Pass the protein! You can’t go wrong with choices like grilled chicken or tofu, pepperoni and diced gourmet sausage. Once toppings are added, place your pizza back on the grill for a few moments to heat up the toppings and melt the cheese. Enjoy! 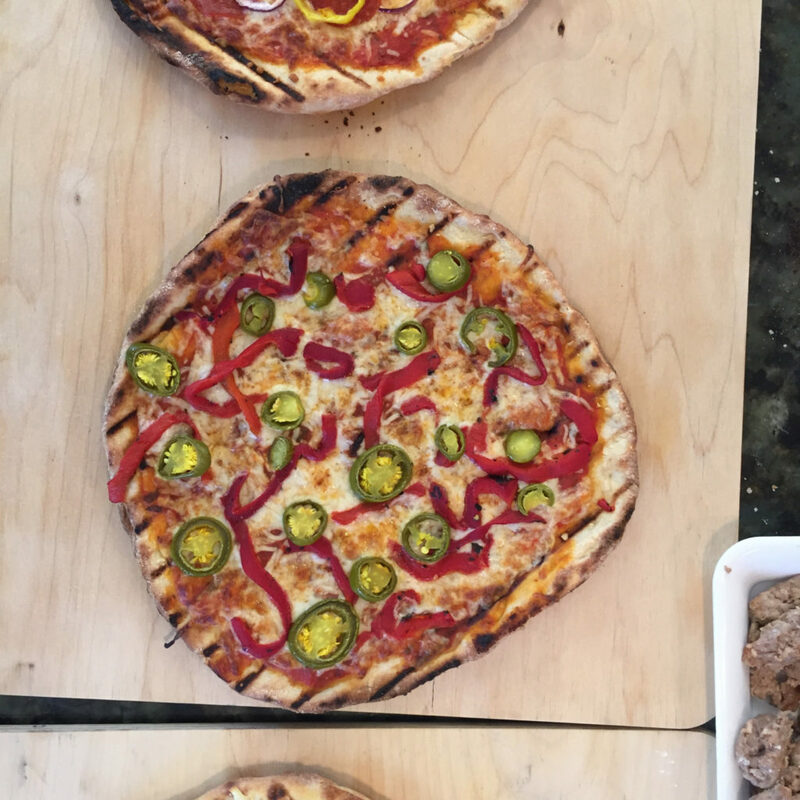 Here are some fun & delicious examples of homemade grilled pizza made right in the Jeff’s Naturals kitchen! Grilled pizza topped with Sliced Tamed™ Jalapeños, Roasted Bell Pepper Strips and mozzarella cheese. 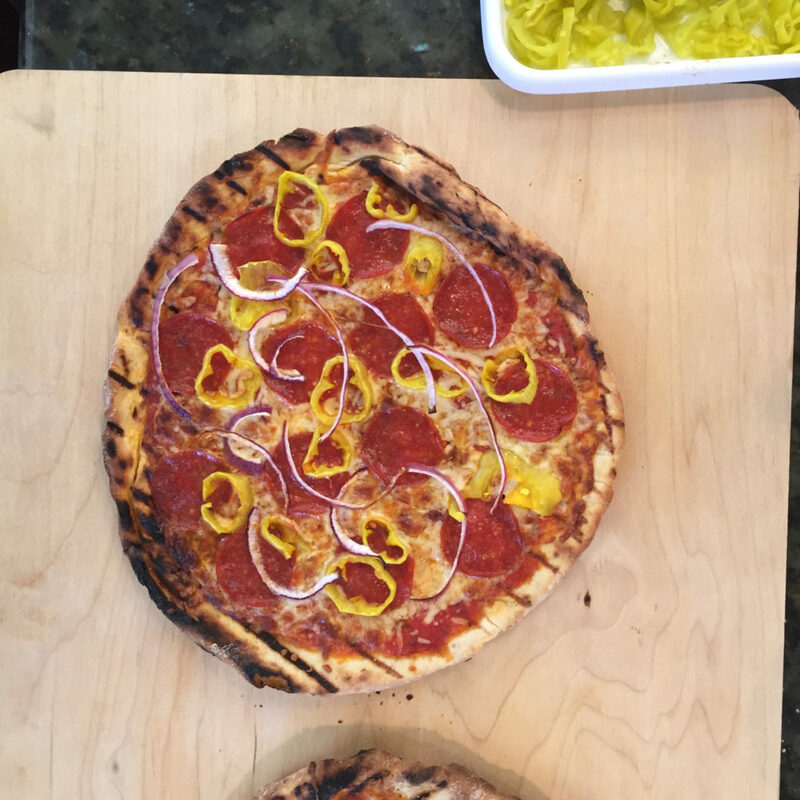 Grilled pizza topped with Sliced Golden Greek Peperoncini, pepperoni, light cheese and thinly sliced red onions. Grilled pizza topped with sliced cherry tomatoes, Sliced Golden Greek Peperoncini and Diced Sun-Ripened Dried Tomatoes. So stock up on your favorite Jeff’s Naturals all-natural olives, peppers, capers and sun-dried tomatoes, pick up (or make) some pizza dough along with other favorite pizza toppings and try it yourself this weekend!